After a disappointing DNF at the Richmond Marathon due to nutrition issues, I’m going back to the drawing board. 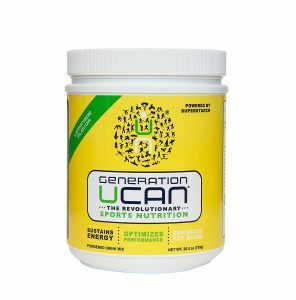 Several runners I know, some at the elite level, swear by Generation UCAN, a modified cornstarch and flavoring mix that you add to water. I’ve thought about trying it, but the $60 price tag (around $2 per serving) has always struck me as excessive. My inner skeptic alarm goes off every time I go to the UCAN website (and so does this guy’s in a surprisingly funny and geeky post about the UCAN hype). We are talking about cornstarch, right? The cheap-as-dirt thickener for gravy that can be found at any grocery store for pennies? First a little background on UCAN. It was developed initially to treat people with a rare condition called glycogen storage disease (GDS). People with this life-threatening condition cannot properly store glycogen and their blood glucose levels fall to dangerous levels while they sleep. In 1984, it was discovered that ingesting uncooked cornstarch before bed kept patients’ glucose levels in the desired range and dramatically improved their lives, many of them children. Cornstarch is cheap, simple, and effective. The only problem with uncooked cornstarch therapy? After about 4.5 hours, glucose levels start to fall and a second dose is required. Parents still had to wake up their children in the middle of the night to feed them. So the scientists came up with a modified form of cornstarch that kept glucose levels stable for 8-10 hours and patients could finally sleep through the night. Then someone had the bright idea to apply the technology to another group of people who struggle with maintaining steady glycogen levels: endurance athletes. You can dive deep into the rabbit hole of the science if you like to learn why starch might be better than glucose, fructose, or maltodextrin and you can learn about carbohydrate and fat-burning until your eyes glaze over. But what I’m after is a solution that is easy on my stomach. And starch could be the answer. UCAN claims that because starch empties the stomach quickly and is slowly but completely absorbed into the bloodstream that it is very gentle on the stomach. THAT IS WHAT I WANT! Any source of carbohydrate can give me enough fuel to get to the finish line fast, but if I can do it without my stomach revolting the entire time, I’m in. But do I really need super-expensive UCAN? Wouldn’t regular cornstarch work? After all, UCAN was developed because cornstarch “only” keeps blood glucose levels steady 4.5 hours. I’m certainly not running longer than that and even if I were, I’m wide awake and could take a second dose. What does the research say? Well, UCAN’s own researchers compared Argo brand cornstarch to UCAN and glucose levels with Argo were only 9% lower after SEVEN hours versus UCAN. They didn’t test (or didn’t publish) results after shorter duration, probably because they are likely to be quite similar until the four to five hour point. Cheap cornstarch from the baking aisle probably works just as well as UCAN! The only difference is the duration of the effects which can be solved by taking another dose. So of course, I had to experiment and come up with my own recipe. Cornstarch and water mixed together is pretty gross tasting, so you need to flavor it somehow. At first I tried a teaspoon of lemon juice with a couple of tablespoons of corn syrup and a few drops of vanilla stevia liquid. It was fine, but I was hoping to come up with something that is all powdered so it’s easy to transport to any race. 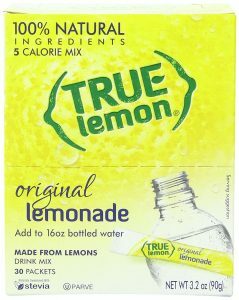 Then I found an awesome, all-natural drink mix called True Lemon. It’s made up of crystallized lemon, lemon oil, a tiny bit of sugar, and a little stevia. And it’s less than 13 cents for an 8 ounce serving! Perfect! I’ve taken it on a few runs so far this week and so far so good. No tummy troubles at all, but I’ll keep experimenting with it, especially at race pace. How does my homemade version compare to lemon UCAN? A single-serving packet of lemon UCAN (not the scoop) contains 28 grams of carbohydrate, 110 calories, 230mg sodium, and 140mg potassium. My version is 30 grams of carbohydrate, 136 calories, 219mg sodium, and 87mg potassium plus a small amount of magnesium and calcium. I’m not going to pretend it’s as delicious as a fresh-squeezed lemonade (neither is UCAN), but it is not bad at all, just a slight chalkiness. A homemade version of Generation UCAN SuperStarch for pennies! Mix all ingredients and pour into two 8 ounce water bottles. Hi Claire! So, I've been doing some research and testing of my own and think I've come up with a hack (due to not being able to find True Lemon here) which is to mix plain cornstarch with a UCan hydrate electrolyte powder packet (these were an accidental purchase and relatively cheap for a 12 pack). I'm thinking about maybe, possibly doing a 100km race in June and need to get this nutrition stuff sorted way before then! Nice idea, Jo! I had a thought to mix it with Nuun. Haven't tried it yet though. I've really been liking this way better than gels on my runs. So far, no tummy issues at all! Glad you are trying it, Mike. Let me know how it goes. It looks like a scoop from a tub of Lemonade UCAN is 80 calories and a serving from a packet is 110. My recipe has 136 calories, so a bit more than both. Does that help? Came across your article while researching UCAN. Greatly appreciate your research into this. So before I make an over priced UCAN purchase, I will give the basic Argo cornstarch a try. I am going to make a 5oz gel flask with it. But I am going to mix it with some of the Peanut Butter powder that is available and some of the iced coffee concentrates, found in the coffee isle at my local grocery store. So I will be getting the cornstarch for fuel with the protein and flavor from the PB powder, and some caffeine and flavor from the coffee concentrate. Great idea! I have tried it with PB Fit and cocoa powder for a peanut butter chocolate flavor and that works well. I also have a chocolate "milk" recipe on the site that is awesome. Please write back and let me know what you come up with! So glad you tried it and liked it! It's a game changer for me. Keep me posted on how it works for even longer runs. Yes, Marta. I used this instead of gels at the Charleston Marathon this past January and it worked so well. It is not a substitute for water, so you still need to hydrate! Claire THANKS for your recipe. Several years ago I changed my diet to fats vs carbs and felt good on longer runs and rides. Still I wanted a boost after 3 or hours. I researched the web and found Dr. Peter Attia would introduced me to super starch and I can. I keep some on hand ever since but it's pricey. I will try your recipe. I've gotten into body building and they use a product called Waxy Maize. Cheaper than ucan. I'm still researching it and insulin affect but potentially it could be an alternative. I thought I'd mention it in case you weren't aware of it. Maybe you are and can give your opinion. Thanks again for trying something and posting it. Thanks, Chris! I did do some research on waxy maize and as I recall, there were several arguments against using it, so I never tried it. This recipe has worked so beautifully that I'm not sure I need to try anything else! Let me know if you try it. My recipe makes 2 servings so the entire recipe would be 272 calories. Thanks for sharing your recipe! I have a chocolate version on the site: https://theplantedrunner.com/sugar-free-chocolate-milk-race-fuel/ and I've also experimented with PB powder, but haven't used instant coffee yet. I'll have to try that! Thanks, Colin. I took a look at the other recipe. Thanks. I have never found a sugar alternative that I liked. If stevia works for you, great. I like the idea one commenter mentioned about using molasses. I'll try that one of these times, but I worry that it may be sticky and harder to mix. Not sure how easily that digests either. The reason I don't worry about the sugar is that it actually makes this a hybrid drink where the sugar calories will be available quickly and the starch calories will digest more slowly. The peanut butter calories will likely come even more slowly. I have mixed up 4 x 16oz bottles to fuel a 38 mile run I'll be doing to pace a friend at the Western States 100 race next week. Will just throw them (dry) in the backpack and add water as I use them. It worked great in training so I have high hopes. Thanks for sparking these ideas. Can't wait to hear how it turns out, Colin. Be sure to write back. I'm not anti-sugar and might experiment a little more with a hybrid as well. Although the mix worked so well for me, I'm starting to get superstitious about changing it! Have fun at Western States! To get a little graphic, I did not have any problems with the "trots" that I sometimes do, but I did have a lot of gas during the run at WS. Next time I use the concoction, I will reduce or eliminate the peanut butter powder. I suspect that is the most difficult item to digest. As for fueling, it did the trick. I had enough energy and it wasn't too difficult to mix on the fly. Good to know! Keep experimenting and let me know how it goes, Colin. I have been using Generation UCAN and very interested in your recipe. I wondered if anyone had tried a recipe for the chocolate protein version. Very interested in your thoughts! Thanks, Lori! I do have a chocolate version here: Sugar Free Chocolate Milk Race Fuel but it does not have protein. I have mixed in some PB Fit peanut butter powder with good success, but you've inspired me to get back to the kitchen! I'll post a recipe soon. Thank you for sharing your recipes! I've been looking for an alternative to gatorade/ucan/gels/etc... This certainly looks like it's worth a try. One question -- I seem to be able to tolerate sugar pretty well (at least up to 6-7 hours). So I'm wondering if using glucose/fructose as the sweetener would allow me to pack some more calories into each serving? Or, would doing so negate some of "slow release" properties that you're going for? I see "Colin" had a similar idea to use molasses for a "hybrid" recipe... Maybe he'll post his results. I have some 12-hour and 24-hour events coming up next year, so want to find something I can tolerate for longer periods of time. My first 12-hour event was challenging because I got to the point where I just couldn't force the sugar down anymore. Fortunately, there were salty snacks at the aid stations, but I want something I can carry with me (easily). Nutrition is so individual, so it's hard to predict what will work for you, Mark. Please experiment in training and let me know how it goes! Hi! Im so excited to try this. Ive been working on becoming fat adapted for the past 6 weeks now and have a half marathon mid October. Ive been trying to figure out what to take with me on my longer runs. Right now Im just using an electrolyte tab like NUUN (or a version there of I can find, im based in Amsterdam). I was wondering if I used one of those tabs instead of the lemon packet, would I still need to add the salts in your recipe? Thanks! I think NUUN would work great and you might not need to add anything else. Try it and let me know! I just made my own version this weekend. My second batch tasted a lot better than the first! :-) I added some whey protein to mine (which is what I had on hand). Batch #1 actually used PB2 (similar to PB Fit), but I wasn't crazy about the peanut butter flavor. Basically, I started with your PB Chocolate Protein recipe and went from there. I added some caffeine to mine as well. The current recipe is also scaled-up to make the equivalent of 10 gels (~ 1000 calories). If you're curious, I posted my recipe here: http://marksibert.blogspot.com/2017/09/diy-energy-drinkgels.html Thanks again for the great article! Glad to hear that you are experimenting with it, Mark! I also find that if I concentrate it too much that it's tough to get out of the bottle. It's more of an issue with the chocolate flavors than the lemon. Perhaps there's some kind of interaction between the cocoa and the starch that clogs the bottles? Not sure. Keep me posted on your lemon experiments! Just got to say thanks for this. Recently switch to a low carb diet and was looking at how to fuel my cycling rides and races as I was struggling after around 90 mins with mental focus (not good when you are smashing through the trails on a mtb), ucaan kept coming up as the best approach, but was not willing to fork out all that cash. This is brilliant, very easy on the stomach and for the early morning rides, just drink 1 bottle and I am good to go for a brisk 2 hour ride. Cracking stuff! So great to hear that it works for you, Phil! Thanks for sharing! The number of low carb people here amazes me. Starch is carb. 100% carbs. Once it hits your intestines it is like sugar. Yes, this is a carbohydrate fuel, no question about it. This is in no way meant to be a low-carb fuel, although some "paleo" folks claim that it is somehow better than sugar. The reason that I prefer starch over sugar is that is causes less stomach distress while racing for me. I assume that's because the starch is absorbed slower, but to be honest, how it reacts differently in the body than sugar so that it causes less gastric distress is not entirely clear to me. But it works! Have you tried or are you aware of any other starches that could be used to work the same? I have a corn sensitivity so running would probably not be the best time to push my luck with that. I use tapioca and arrowroot starches in my cooking. Any idea if these would work the same? Not as cheap as corn starch but still cheaper than ucan. I've been reading about SDS starches but haven't found anything that confirms it would work. Of course this is clearly not a common use. Great question, Charlie! I actually now use tapioca because I find it to be a little less "chalky" than corn. Works exactly the same. Another reader has used potato starch and says it works well. If you try it, let me know how it goes! Do you use the same amount of Tapioca as your corn starch recipe? Yes, I use the same amount. Claire, do you cook the tapioca before mixing it? Or, do you just mix it, right out of the box, like you would the cornstarch? No, you do not cook either starch. Cooking dramatically changes the structure. Fantastic article Claire!!!! The price of UCAN is prohibitively expensive! This is so cheap and I am very grateful. I will buy what ingredients I can in the UK and Argo is possible but my question is, are other makes OK? I would prefer to buy Organic and non Geo. I would imagine any brand of cornstarch would work. Keep me posted! Thanks, I will Claire. I looked it up on Amazon UK and you can get the same lemonade mix!!!!!! Also there is a version that hasn't been artificially sweetened so that is much better! I don't really want Stevia if I can help it. I think Erythritol is better but I'll see if I can do without. I also found lime lemonade :-) So with cornstarch I have purchased unflavoured electrolyte power and unsweetened lemonade or lime powder for £17.97 instead of £60 plus and extra 200g or so. Absolute bargain! Why not just eat a cup of whole corn before a race or workout instead? Interesting idea, but I think that would be hard on your stomach. And for the marathon, it would be pretty difficult to eat corn while running! Too much fibre and too filling. You'd have gut problems and not portable for exercise. I'm loving this idea but worry Is it bad for your health to eat raw cornstarch like this ? And in relatively high quantities? (high quantities for cornstarch which is generally used in low quantities in foods as an additive) Any thoughts on the long term health effect this might have? Great question and a valid point. 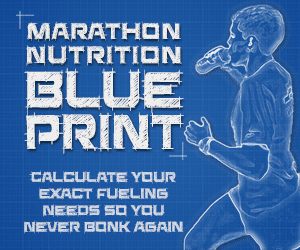 While I'm not a nutritionist, the truth is that no fuel that is good for running marathons is particularly good for you long term or when you are not running. Gels are glucose and/or fructose, in other words, pure sugar. Certainly ingesting as much sugar or starch (or really any high calorie carb) as you need to run a marathon well is not good for you all the time or in the long term. So I wouldn't drink this (or any marathon fuel) every day. As far as cornstarch being raw, I'm not aware of any health concerns specific to this, but if anyone has any research on that, I'd be very interested to learn! 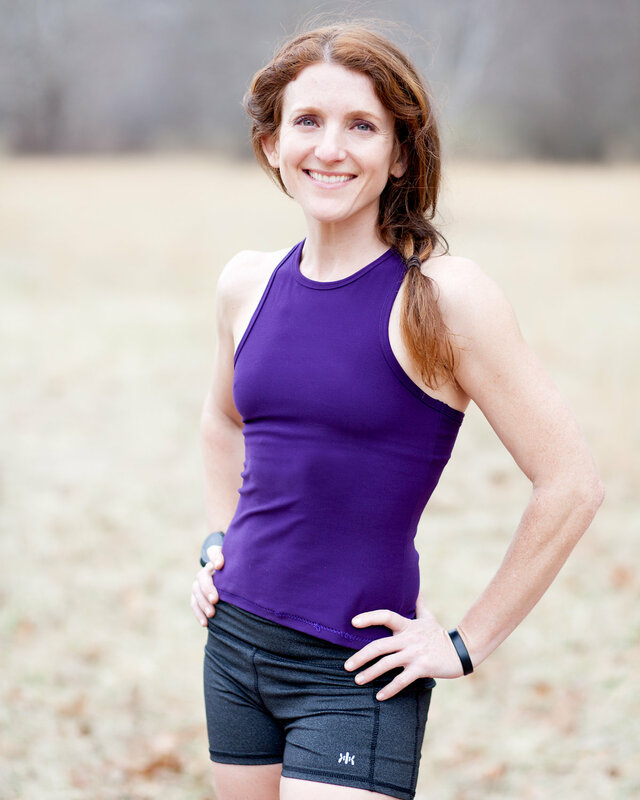 Claire, how do you approach training and nutrition for endurance? I see some of the recipes and they look great and I will certainly try some but do you have a net cab figure per meal or day? I am often lchf (low carb high fat) although off the wagon pre Christmas ;-) My goal is to burn fat efficiently but doesn't this mean being in ketosis which normally means less than 15g carbs per day, although I guess perhaps some flexibility if training hard but not much. I also use intermittent fasting to achieve my goals and it is also very healthy to do so. I'm competing in Triathlon X (Words toughest Iron Man distance Triathlon....yes I'm mad!) in June and I need to get nutrition and fat burning right because I won't use gels anymore. I'm very grateful to you for sharing this cheaper version of Generation UCAN!!!!! I will use this and be lchf but back to my original question about your approach and ketosis? Sorry rambled on. I'm a big fan of whole carbs: fruit, veggies, nuts, seeds, and whole grains. Corn starch is 100% carbohydrate so it is not a low-carb product. I burn fat by running lots of easy miles! All three macro nutrients are essential, and my carb intake usually is around 50-60% so unfortunately, I can't give you any advice with lchf. Thanks Claire, I was just interested in how you achieve fat burning while taking in Carbs. Yes corn starch is but the great thing is no insulin spikes so I can still be lchf and burn fat and stay in ketosis :-) I might experiment on endurance training with some complex carbs and see how it works. Thanks again! Thanks Claire, In Ketosis we trickle carbs, so I have been advised by several endurance athletes to drink one 1/2 hour before start, and then one every two hours. 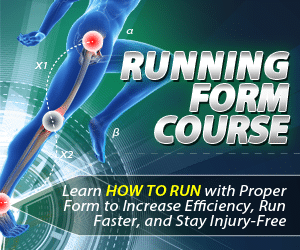 Tomorrow I'll try it out for my 4-hour training run. I will also be trickling GU, Smarties and electrolyte water. The link below is to my current gameplan and a link to your recipe! If this works well, "FauxCan" will be my source for the 3M Half Marathon and the Austin Full Marathon! https://thenextminute.wordpress.com/2018/01/11/catching-up-2/ Wish me luck! I've updated my recipe to make about 60oz at a time. (I use an entire 16oz box of cornstarch for the batch.) I have also "hacked" my bottles to make it easier to get the gel out, replacing the stock "bite valves" with Camelback "big bite" valves. Details here: http://marksibert.blogspot.com/2018/01/diy-energy-gel-update.html I'm just about out of chocolate protein powder, so the next batch will probably be another flavor - maybe something akin to Vanilla Bean Gu. Claire, just wanna thank you for sharing your knowledge . Yup, UCAN is so expensive and I will use this an alternative, in fact I'm runing 10K tomorrow and I will try it. Have a great weekend! Thank you, Eric! Best of luck in your race and write back to let me know how it worked! Hi Brian! My website was hacked and all the recipes have disappeared! Working on a fix. This recipe is 70g (8 2/3T) cornstarch, 1 True Lemon Packet, 1/8 teaspoon salt, 1/8 teaspoon Morton's Lite Salt, 16 ounces of water. Mix all ingredients and pour into two 8 ounces bottles. Makes 2 servings. Each contains 136 calories, 30.6g carbohydrate, 219mg sodium, 87mg potassium, plus small amounts of calcium and magnesium. Hi Claire - I'm really interested in trying this recipe. Stupid question: what sort of device do you put the mixture into for your run? Since I'm new to the DIY gels, I'm curious about the different options and what's worked well for you. Thanks! This is a liquid fuel, not a gel, so any runner's water bottle will work for this one. For the gels, I like to make my own gel packs from a FoodSaver, but there are also gel flasks on the market. Hope that helps! HI, I have been dealing with GU's and other gels and the older I get the more they irritate my stomach. I got to the point were I could not take it anymore. I have been using your recipe now for a couple months and the stomach issues are gone. Works great for me. I am now starting to train longer than 2 hours at a time in preparation for the Louisville Ironman. Just one clarification please.... Do you drink an 8 ounce serving every 1 hour or every 2 hours? Thank you for your support. Glad you like it, Paul. How much you drink depends on your size and fitness. Most people need to consume between 40-70g of carbohydrate each hour. Some people can even get up to 90g an hour! In general, if your stomach can handle it, more CHO is better than less. Here's my race report from February where I explain all the details: https://theplantedrunner.com/the-marathon-is-an-exercise-of-patience-2018-mesa-phoenix-marathon-race-recap/ Everyone's fueling needs are different, so adjust according to your body weight. I'm not very big, so I don't need as many calories per hour as most men would. I'd be happy to answer any questions you have. Best of luck in your race! You may get more of a insulin spike with this product (vs. Super Starch). This in theory would allow for less fat to be used as a fuel source as insulin spikes are negatively corrected to fat burning. These effects may be mitigated however shortly after vigorous exercise begins (measured at 70% VO2 in elite athletes), as insulin levels may drop close to baseline observed in super starch atheletes. This drop in insulin level with vigorous exercise could be further influenced by the personal fitness level of the individual. So there is a lot to consider. If you are doing sustained, long aerobic exercise, you should look to fuel this activity from fat burning primarily. 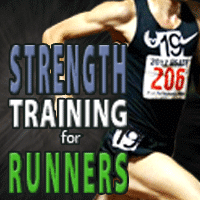 Superstarch should be used to supply the muscle with glycogen for explosive exercises/sports. Cheers. Thanks, Shaun. I think it's unclear if a spike in insulin is really a bad thing for endurance. Sure, fat burning is great, but when you have access to a steady stream of CHO I'm not sure how much it matters. The mitigating factor is if you cannot intake enough calories due to stomach issues. From what I've read, being highly fat adapted might be a good thing for your health, but it hasn't been shown to improve performance. Hi Claire, Really interested in this recipe. I'm currently training for Ironman Canada, which is in two months time. I have been following a program designed by Ben Greenfield, and he also advises UCAN for during race nutrition but he also recommends adding MCT Oil and Amino Acids to this mixture without adding electrolytes. I have researched other sites and formulas like 3Fu3L created by Brian MacKenzie (Crossfit Endurance) uses Waxy Maize for their carbohydrate of choice. My Diet has been primarily high fat (65%) moderate carbs (20%) moderate protein (15%) and I have heard so many mixed opinions about how to fuel during long races. the Skratch methodology is to focus on electrolytes and hydration and eat real food (portables) as calories. Other endurance coaches and enthusiasts prescribe Hammer, GU, and Cytomax, and other products that are fast acting carb sources that consist of Maltodextrin, Dextrose, and Fructose. I guess what I'm really looking for is something simple, sustainable, that will help me perform well enough, and won't destroy my gut during the race and the days following. Thank you for providing your recipes, and if you have any further insights I would love to hear them! Thanks, Remy! The reason that there are so many opinions on how to fuel is because everyone's body reacts differently to fueling under stress. Ingesting carbohydrate in any form is essential for endurance performance no matter how fat adapted you are. The reason starch works so well is not that it's "better" than other sources; it's just super easy on your stomach. Some athletes can eat one type of fuel for 24 hours and others have to switch things up to avoid being sick. My advice is to take everything you read with a grain of salt and practice what works for you. And then write back and let me know how it went! Best of luck! Thanks for the recipe! I don't always do great with corn. Ever try potato starch or green banana flour? Thanks, Lauren! I actually use tapioca flour now since it mixes better than corn. A reader of mine has tried potato with good success. If you try it, let me know how it goes! So happy to hear that this has worked so well for you, Stan! Thank you so much for this recipe. I was a UCAN SuperStarch user and while I love the benefits I got from it, I was not a fan of the price tag. I finished my last container of the regular UCAN SuperStarch (unflavored) and spent the next two weeks of running not using anything. I could feel my body dragging a bit on long runs (6+ miles) during this time. I mixed up a batch of your recipe and went for a 9 mile run to test and my levels were right back to where they were with the UCAN. I've been using your recipe for about 2 months now and have not seen/felt any drop-offs with my energy throughout my runs. Again, big thank you for sharing this recipe! Happy to hear that it's worked so well for you, Will! Really interesting post! I'm going to try some organic, non-gmo corn starch and compare to how I feel with my UCAN. Would love to save a few bucks. Thanks for sharing this post! You're welcome, Michael! Let me know how it works for you. Hi Claire, One of these days I'm going to make this, as my huge tubs of UCan are about empty. Question: What is - and why include - "lite salt"? Can I just use a 1/4 tsp. regular salt? Thanks! Hi Susan! The Lite Salt contains some salt (sodium chloride), as well as potassium, calcium, and magnesium. So it provides additional electrolytes. Hope that helps! Claire, I just wanted to drop in and say thanks for sharing this. I love my Ucan, but cringe every time I have to reorder. Looking forward to trying this out. You're welcome, Chad. Let me know how it goes! Hi Gary, Any kind of powdered drink mix would work. The reason I like the TruLemon is because it's not artificial. Hi Claire, Tapioca has been mentioned a few times as an alternative to corn starch. You say "tapioca flour". There seems to be some confusion regarding tapioca flour vs tapioca starch. Some say that they are one and the same while others say they are actually two different products. It was indeed harder to find starch than flour, but I finally did in a Vietnamese grocery store. I'm going to try your recipe with the starch on my 32km training run this weekend but am curious where you stand on the starch/flour debate. Oh yah, I'll be using the NUUN tablet in place of the salts and lemon crystals. Thanks very much Clare! I am testing out this recipe in my marathon training for a May race. 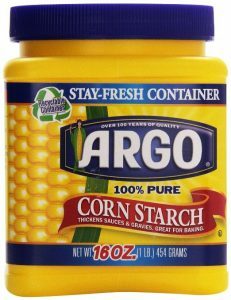 One thing I've changed is the source for the cornstarch: Argo uses GMO corn. I know opinions vary on this but corn is one of the most heavily mono-cropped farm products in the US. Pretty unsustainable in the long term. I am using Bob's Red Mill starch, but there are other non-GMO/organic sources as well. Stumbled upon this recipe last night and decided I would give it a try on a 90 mile bike ride today. For flavoring and essential minerals, I used Liquid IV Hydration Multiplier. The taste was great and the results were too. Thanks. BTW, if you could elaborate on the starch vs flour debate, I would be most appreciative. Glad it worked for you, John! Flour is a milled grain or root that contains starch (defined as "an odorless, tasteless white substance occurring widely in plant tissue and obtained chiefly from cereals and potatoes. It is a polysaccharide which functions as a carbohydrate store and is an important constituent of the human diet. "), but also other parts of the grain/root as well. Typical corn starch is almost 100% starch. Tapioca flour should be ground manioc root and tapioca starch should just be the starch. But people use the terms interchangeably, when they are technically different. Hope that helps!